Naomi has continued her good work reading all the shortlisted titles for the Giller Prize. 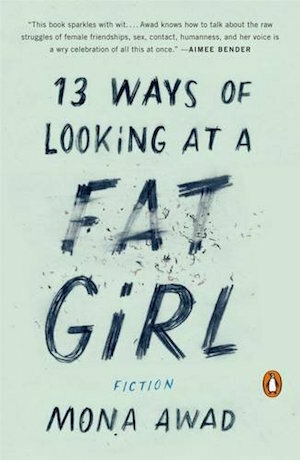 Earlier this week she reviewed Mona Awad’s 13 Ways of Looking at a Fat Girl, a book she describes as almost crushing her with hopelessness for all those people who are slaves to dieting and to the gym. I believe in healthy living, but that is not what it should look like. This book is a plea to change the way we see and represent women; a plea to let women be themselves and to feel good about it. Elizabeth is so preoccupied with the way she looks that there is no room in her head for anything or anyone else, leading to dire consequences in her daily life and relationships. I wouldn’t hesitate to recommend it because of all the important and insightful things it has to say about body image in our culture and how crippling it can be. To read Naomi’s review in full, please visit her blog. Well, this seems rather meta, writing about my own review published on my own site. It also seems rather fortunate that the one book I managed to read from the Giller Prize longlist just so happens to have made the shortlist. Mona Awad’s 13 Ways of Looking at a Fat Girl is a short story collection disguised as a novel. It charts one woman’s trajectory from chubby teen to a painfully thin woman whose weight loss has not made her happy: she’s hungry and angry all the time and her relationships, particularly with her husband and work colleagues, are strained. It mines a dark psychological seam of people who have an unhealthy relationship with food. It’s wry and funny, but also unsettling, for not only does Awad turn her sharp, perceptive eye towards the all-consuming issue of weight control, she also focuses on how this affects relationships between mothers and daughters, female friends, colleagues, sexual partners and the people we marry. To read my review in full, please visit my blog, Reading Matters. Has anyone else read this book? Do you think it will win the Giller Prize when the winner is announced on 7 November?